Four eastern European men have been sentenced for a card "skimming" scam using cash machines in Cardiff. The London-based gang all admitted conspiracy to steal. Police believe they may have taken up to £200,000. Cardiff Crown Court heard they put false fronts on the cash machines, and installed small video cameras to film shoppers tapping in their PIN numbers. Three men were given four year jail terms and a fourth was sent to a young offenders' institute for four years. Sentencing, Judge Christopher Llewellyn-Jones also recommended that Rulan Ashan, 20, from Chechnya, Lucian Carabgeac, 32, from Romania, Ivan Grosu, 23, from Moldova and Vornicu Florin, 26, also from Romania, be deported when they are released. The court heard that Ashan was an asylum seeker, while the other three men were illegal immigrants. "Your actions are such that every card holder has become fearful of using cash points," said Judge Llewellyn-Jones. "Every member of the public will have to be watchful to make sure the machine is not the subject of an attack. "You had the bank details to access 129 accounts with the potential gain of up to £200,000. This is offence is so serious I must give a deterrent sentence." 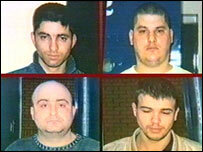 The four were caught after staff at the city's Cathedral Hotel became suspicious, and police officers seized hi-tech equipment including computers, cameras, tape recorders, radio transmitters and a false fascia of a cash machine. Prosecutor Nuhu Gobir said: "Equipment seized from the defendants showed the defendants were engaged in a well organised and highly sophisticated operation to defraud banks of thousands of pounds. "The false fascia was examined and found to contain an electronic card reader and memory recording for retaining the details of bank cards." The court heard that details would be transmitted via radio link to a person nearby and downloaded onto a laptop computer. The hearing was told that police were unable to prove what part the men had played in the conspiracy to steal. Matthew Roberts, mitigating for Ashan, had earlier told the court he had seen "torture and tragedy" in Chechnya. Anthony Vines, who was defending Carabgeac, said the incident had been a "shameful episode" which he deeply regretted. Mitigating for Grosu, Heath Edwards, said that his client was aware that his actions "strike fear into the heart" of people using cash machines. And Sophie Wood, who was representing Florin, said her client had been a "foot soldier" at the lower end of the criminal scale.